Nearly every good home-cooked meal begins with a handful of chopped alliums sautéing in a little butter or olive oil. Allium is the onion genus, a large family of plants whose bulbs and greens share a characteristic pungent aroma and flavor – familiar culinary varieties include all types of onions, scallions, leeks, garlic, shallots, and chives. Cooks and foodies know that the savory taste of alliums, whose flavors range from spicy to sweet, hot to mild, enhances every dish from the most extravagant creation to the simplest salad. Luckily, the mild winters and dry summers of the Pacific Northwest enable northwest gardeners to grow and eat an abundant supply of these essential veggies all year – even in February and March, the lean cold months of late winter! It takes some planning and garden space, but as the nutritional, environmental, and cultural benefits of fresh, local or homegrown produce become more apparent, more gardeners can see that planting and harvesting a year round supply of alliums from the garden is well worth the effort. The jumbo sweet onion from Washington famous for its huge, juicy rings. Slightly flattened bulbs have light brown skin and mild, white flesh. Transplant them now and you’ll be pulling sweet fat onions by June or July. Walla Wallas can reach 5 to 6 inches in diameter and are superb for slicing fresh onto burgers or sandwiches, chopping into potato or pasta salads, or for making a delectable, light, summery onion soup. 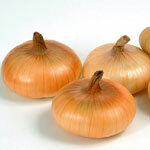 Eat them fast, though – they are too juicy to keep as well as the more pungent fall storage onions. Plant ‘Walla Walla’ onions 4-5 inches apart in rows 12-18 inches apart in sun. Stop watering when bulbing starts, and harvest when stalks begin to brown and fall over. 90-100 days from transplant. Plant 1-2 inches apart in rows 12-18 inches apart in sun. 40-50 days from transplant. Open-pollinated. Cipollinis (“cheep-o-LEE-nees”) are small, flattened onions with sweeter flavor than regular white or yellow onions and a delicious creamy texture when braised or roasted. They can be hard to find outside of specialty markets (and expensive when you do find them) but are as easy to grow as other onions, so they’re an ideal crop for the home gardener. ‘Gold Coin’ produces little button-shaped bulbs just 1½ to 3 inches wide by 1 inch tall. They keep well and can be braided for storing, to display in your kitchen throughout autumn (if you can resist eating them right away). Try roasting cipollinis with balsamic vinegar, to further concentrate their sweetness, or serve them creamed with wild mushrooms. Plant 3-6 inches apart in rows 12-18 inches apart in sun. Stop watering when bulbing starts. Harvest when stalks begin to brown and fall over. 60-80 days from transplant. Open-pollinated. Very large, quick-growing green onions with thick, straight, 5-6 inch white stalks topped by 6 inches of blue-green leaves. You can increase the blanched white part by transplanting them deeply or hilling up extra soil around the stems as they grow. Chop the white and green parts to add fresh, mild oniony flavor to salads, stirfry, omelets. Plant 1-2″ apart in rows 12-18″ apart in sun. Harvest as needed. 30-40 days from transplant. Open-pollinated. Onion starts are fairly tough and can be easily transplanted, but there are a few things you can do to ensure the biggest, tastiest harvest. Before transplanting work the soil with a spade to loosen up the top 6-8 inches. This is especially important for full-size onions, because if the soil is hard and compacted they will have trouble expanding to form large bulbs. 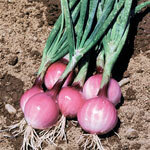 Work some complete organic fertilizer into the ground where you will plant the onions. With a hoe, small spade, or your hand, form a shallow (about 2 inch deep) trough in the loose soil. Before removing the starts from their pot, trim off about the top third of the greens (to reduce the amount of moisture the transplanted starts will need to take up, so they can concentrate on rooting well). Dump them carefully out of the pot, shaking off the soil and separating the roots gently with your fingers. If it’s a warm, dry day or you think transplanting will take more than a few minutes, set the transplants in a dish of water in the shade to keep their roots cool and wet while they wait for their turn to go in the ground. Take a handful of transplants (10 or 12, maybe), and lay the root end into the trench you made, with the tops leaning against the side and sticking out the top (see individual varieties for how far apart to space them). One by one, grab the top of a start, pulling it upright as you push soil in around the root end to hold it up. Try to plant them about as deep as they were in their pot. When the first batch has been tucked snugly into the soil, take another handful and do it again, until you’ve filled up the row or used all the seedlings. Transplant even the smallest seedlings if you have room – they should grow and catch up to the rest. (Even if you don’t have room to space them out properly, you can plant any leftovers very tightly together in a small space – they won’t bulb but you can just harvest them as scallions in a month or so.) Water well after planting. 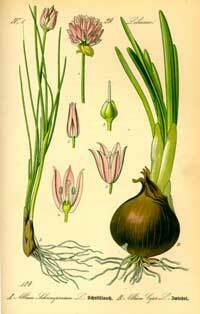 For a complete list of the alliums we’re growing this year, see our Vegetable List. Cooking with Onions has some mouth-watering recipes for inspiration or check out these Mediterranean recipe cards. Onion 594, pictured to the right, is a Walla Walla onion sculpture created by Travis Reiff for Sweet Onions on Parade in Walla Walla, Washington.